Hunting, habitat destruction from the 1995 volcanic eruption, and the arrival of the recent fatal fungal infection, Chytridiomycosis (or “chytrid”), has devastated the population of these frogs. North America’s black-footed ferret was thought lost in the 1980s until several were discovered in Wyoming, which inspired a recovery programme. The California condor was reduced to 27 individuals sparking a controversial, but successful, captive-breeding initiative. 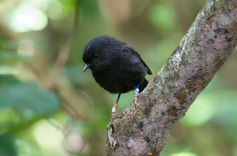 In New Zealand, the Chatham Islands black robin was rescued from a single breeding pair. On Mauritius, once the island of extinction, the local kestrel was considered a lost cause by the mid 1970s and was then the rarest bird in the world, yet decades later the population has been recovered by active management and now hundreds of pairs of birds live free on the island. These cases required pioneering innovations, such as double-clutching (removing eggs to encourage pairs to breed again), using common species as adoptive parents, and training captive-bred animals for wild release. Leaders such as Don Merton, Tom Cade, Noel Snyder and Carl Jones shared ideas with colleagues across continents, fuelling knowledge and experimentation. Actually getting on with the work is important. For Jones, too many people “talk about conservation…but we’ve got to do it rather than talk about it”. Fieldwork requires painful attention to detail, literally sitting with the animals to prevent disturbances, then monitoring offspring survival, assessing and carefully improving habitats, and moving individuals to new, safe locations. Conservationists need patience and determination to overcome disappointments. They must seek to understand changing circumstances, keep open to ideas and be willing to develop new approaches if things do not go well. Carl Jones suggests that recovery requires about 20 breeding cycles. That means 20 years for species that breed annually. Improved understanding can however, accelerate recovery. There are two common failures of action, lets call them type 1 and type 2 (which is what statisticians call them). Another definition would be a mistake in identification between ‘common causes’ and ‘special causes’ of variation; without understanding the difference we risk just ‘tampering’. What we want to avoid is the delusion that feel like we are doing something useful but actually only making things worse (Deming, 1982). Common cause situations are those where performance goes up and down over time and if analysed properly can be seen to occur over a relatively predictable pattern: if we change nothing, the performance level will most likely continue. The problems arise when someone thinks they see a real difference between points of data when in fact no such thing exists. This a type 1 error: we observe a change which is really only a natural effect of background ‘noise’ yet we choose to act on that ‘change’. For example someone in the team achieves a great result whilst others do not achieve the same result. Is the difference because of the person, or something else in the wider context? Perhaps, as is often the case, they just got lucky and happened to be the one that achieved the good result. Next week it might be someone else. The analogy is a fire alarm going off indicating a fire when in fact there is no fire. It is easy to fall into type 1 errors assuming highs and lows of performance which don’t exist. 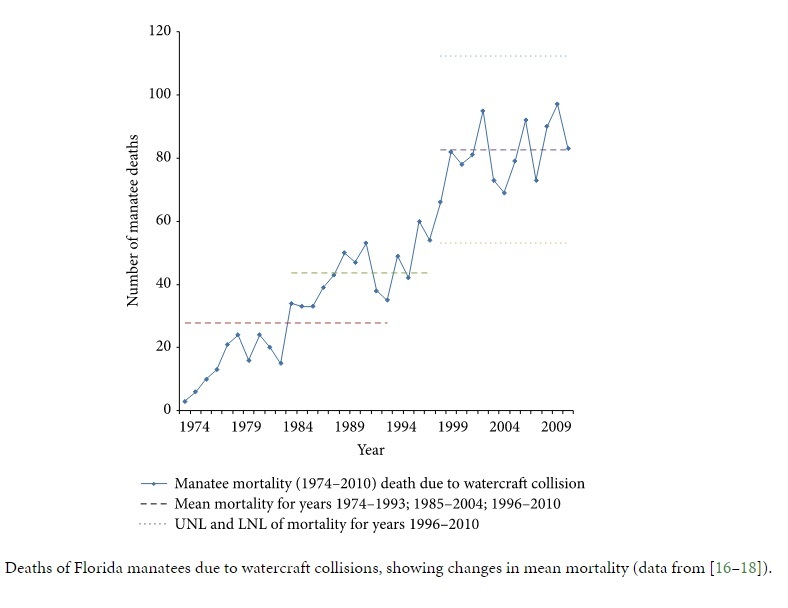 This is a ‘mistake of commission’ – doing something that should not have been done (Ackoff et al 2006). Some special causes are obvious, for example a major increase or decrease in performance or a freak accident. However, sometimes hidden patterns of performance can indicate a real change which might easily go undetected if we consider each data point as a ‘one off’. This is a bit like a fire breaking out but the fire alarm not ringing. The fundamental problem is that these genuine changes are due to ‘Special Causes’ something real which is impinging on the system. The issue here is that the solution sits outside the system – don’t redesign what you have as it will not replicate the situation – that is just meddling and will make things worse. For example, cycles of deteriorating work output followed by improving work output by one person might indicate an underlying special cause which needs to be addressed (health for example), so meddling with the design of the work in itself would be counterproductive. Furthermore if the manager does not look at performance over time, these cycles might not be detected anyway – on average they might look like a reasonable level of output. Ackoff calls this a mistake of omission –not doing something that should have been done. An example can been encountered in Human Wildlife Conflict. A ‘rogue’ animal may change its behaviour due to injury or illness and preferentially predate livestock for a period of time. If a decision is made to destroy the animal (or relocate it to a more remote area) should the same policy be applied to any animal which predates livestock? For the one-off animal a one-off intervention might succeed, but if it were to be repeated for every animal it would certainly be costly (relocation) and might make things worse (e.g. if destroying every animal). Clearly identifying whether the rogue animal is an ‘exception’ or a ‘common cause’ is important. IS THIS REALLY TRUE, AND IF TRUE, DOES IT MAKE IT RIGHT? In a nutshell those previous statements on management and leadership summarise conventional wisdom accrued since 1900, first through either traditional ‘scientific management’ methods or later ‘human relations’ approaches. The latter approach, pioneered by Elton Mayo, was apparently devised to counteract the rigidity and hierarchies of the former. Unfortunately both approaches have the same defective focus – ‘doing it to people’. They are both a reflection of a command-and -control mindset which many would percieve as ‘managerialism‘. There are two basic reasons for hiring people – to do the work and to improve the work (a tag line which I attribute to the psychologist and author John Seddon). Managerialism involves neither activity – so why do we have managers and leaders? A leader’s job is to enable workers to do those two things and provide a context for understanding that activity. Improvement comes from understanding the system and making meaningful improvements to ensure better outcomes. ‘Doing it to people’ does not achieve this, but simply adds new layers of new ‘work’ – appraisals, briefing meetings, writing reports, filling in forms. Worse still this work assumes that for people to be effective they need to have stuff ‘done’ to them – like an inoculation for inherent bad characteristics – perhaps laziness, lack of intelligence or (potential) insubordination. This is the darker side to a manager’s mindset. Whilst most managers and leaders do not want to be working for the ‘dark side’ and genuinely want the better for their teams, they must understand that if they follow the scientific/human relations approach the consequences of their actions are: de-motivation, a loss of dignity, a diminished sense of purpose, and reduction of productivity in their staff. In other words the effect on their team is just as if they actually had a negative attitude towards those people. In other words their staff will not like it and work will be negatively affected. In knowledge industries, additional contributions to the total cost of this disruption is hidden, for example losses of skilled workers, high staff turnover and recruitment and so on. In conservation projects these costs can be proportionally high and the impact on project continuity and sustainability huge. Responding to variety is one thing; but a variety of perspectives is quite another challenge, for both practical reasons and ethical reasons (Rogers & Williams, 2010). Let’s think practically first – our understanding of many things will be flawed if we only consider one point of view. Perspectives are closely associated with what you value. Perceptions of value have implications for stakeholders and for science – do we judge our work outputs by our own perspectives – or do we work to the expectations, needs and priorities of the people experiencing those outcomes? In conservation this can be complicated. There are also serious ethical implications in considering a diversity of perspectives. A person or a certain group of people could get harmed if you don’t see things through an alternative perspective. This is particularly important when working with local communities in wildlife areas – what will be important to sustain conservation success? That topic is worth a separate blog in its own right, but Jane Goodall has recently challenged us to stop thinking ‘West knows Best‘ – listening and understanding gives insight. Aside from that, our effectiveness as people is influenced by our understanding of alternative perspectives. A wider perspective allows us to consider inter-relationships better: how does my work affect yours, who else might be impacted, what are their priorities? Often, any changes we make in a system of work are not simply a matter of cause and effect – not as straightforward as ‘I do this, then they will do that‘. It is not just about A+B =C. There may be unforeseen consequences: more of C may impact on D, E, or F. Using up B might cause problems for X and Y and so on. we should carefully consider the implications of any boundary which we set. Rogers, P. and Williams, R. (2010) Using Systems Concepts in Evaluation, in Beyond Logframe: Using Systems Concepts in Evaluation, N. Fujita (Editor). Foundation for Advanced Studies on International Development, Tokyo. The term ‘learning organisation’ first gained popularity in the 1990s and is, unusually in the faddish world of ‘management-speak’, one which seems to have endured. What is a ‘learning organisation’ and why try to become one? An organisation that learns is best able to adapt. It finds out what works and what doesn’t and, most importantly, does something with that knowledge. Learning is a vital component of conservation management and enables continued insight into complex systems (ecosystems, social systems, agro-ecosystems and the like) which change over time. The most successful programmes are ones which have learned to adapt and have learned more about their species and ecosystems, their threats and opportunities. However, a learning organisation doesn’t just accrue information. Some organisations appear to be addicted to data – searching for the ‘facts’ before decisions can be made. This is NOT a characteristic of a learning organisation since it will cause one of two problems (or both): either the organisation will boil itself to death in trivia and noise and not pick up the important signals; or statically churn data without adapting – paralysis by analysis. This is not learning. A definitive feature about learning is that it involves proactively seeking out knowledge; to make good judgements based on insight. If we want people in our team, department or organisation to start learning, then we should steer them towards good judgements based on insights from analysis. The statement ‘costs are out of control’ is an opinion. However, if we define costs and out of control, we can then test that hypothesis and progress in our understanding (Scholtes 1998). This requires new disciplines of thought. For Deming, part of this transformation is about getting managers to see themselves as experimenters who lead learning. 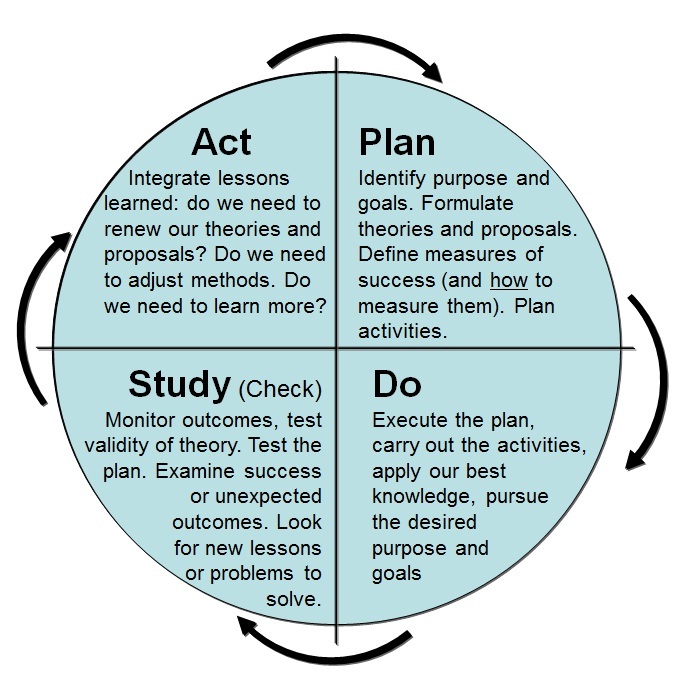 A good way to represent this type of approach is the Deming Wheel (or Shewhart Cycle, as Deming labelled it) Plan-Do-Study-Act; the never-ending cycle of learning (Scholtes 1998). Deming called for a change from ‘opinions’ to hypotheses which we can test, understand and then apply that learning to our work activities. Scholtes explains the phases of learning. 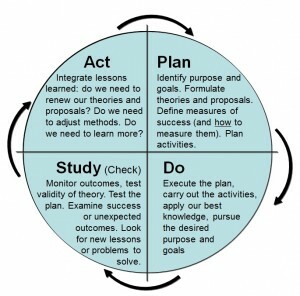 ‘Plan’ and ‘Act’ are the stages of developing and reviewing theories and hypotheses. ‘Do’ and ‘Study’ are about application – work and the examination of work and outcomes. The phases of thinking and doing are intrinsically linked. The best practitioners apply good science to their conservation interventions. Lewin, K. (1952) Field Theory in Social Science: Selected Theoretical Papers, p. 346. London: Tavistock. The recovery of endemic bird species in Mauritius has been notable in enabling the downlist of several Mauritian species on the IUCN Red List. In the case of the Mauritius Kestrel and the Pink Pigeon the recovery was from a handful of surviving individuals. How has this level of recovery been possible? 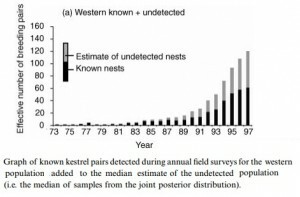 Carl Jones, who has led the Mauritian programmes for over 30 years, was quick to enhance his own knowledge of kestrel breeding with techniques which had previously proven successful in efforts in New Zealand and the USA. He has used a better way. Instead of imposing a command-and-control structure on his teams, he has developed a ‘system’ and more importantly, he appears to be applying systems thinking in the way that he manages the team. Every part of the system; habitats, diet, supplementary feeding, breeding facilities, nest locations, monitoring, predator eradication, bird behaviour, technical skills, equipment. When we look to other sectors we see approaches which are reminiscent of the Mauritian philosophy. To some extend the levels of improvement seen in the GB cycling team over the past 10 years are a comparative illustration. So what does this mean for us in pursuing changes and improvements in our own conservation projects? It suggests to me that any organisation would benefit from a culture of learning and continuous improvement; work on what you CAN influence in the reasonable hope that it will overcome the factors over which you have no influence. Carl Jones puts this down to understanding the species, their ecology and threats. As Juran (1989) said – focus on the vital few rather than the trivial many to achieve your purpose then, as Senge (1990) urges, always keep an open mind to unexpected outcomes and be ready to understand what else needs to be done to improve. It is the size of influence which is important. The smallest things can be significant influencers. Conservation leaders need to be ready to spot and act upon opportunities when they arise. In recent years we have started talking about the suitability of systems thinking in relation to conservation management. The approach is non-hierarchical (so is not reliant on a political or cultural norm) – it is a way of managing that cuts through the necessity of a hierarchy. If you do have hierarchical leaders, they just need to start asking different questions. Systems thinking (e.g. the team are a system, they operate in a work system, the organisation is part of a larger system) clearly fits with the notion of ecosystems and complexity which is at the core of conservation. Knowledge is at the core of systems thinking, optimisation of the system is critical and anything which undermines this is to be avoided. Simplicity of intervention is paramount, and taking different approaches to managing ‘exceptions’ and ‘the norm’ is importnat. (i) data over time or (ii) cause and effect. The start point in working in a complex environment is to study it (not plan) and to understand how it currently supports the conservation purpose, and how (through flow of processes and systems). If the purpose of the system is understood, then measures to examine the system can be put in place and then methods for improving the system versus measures and purpose can be experimented with, thereby further informing the understanding of the system. When you want to make a change the only plan you need is how to study the system – all the work thereafter follows. In ecosystems we are unlikely to know all of the complexity of processes, but by continual experimentation and learning we understand what has a positive impact (and what does not) for the species of concern. The ‘demand’ (defined as species and ecosystems’ needs including threats) is the biggest lever for change – so it must be understood. It can be understood by the people doing the work (or affecting the system) only through their study of and understanding of the realities and patterns of those demands. An understanding of ‘demand’ drives the leader to consider which bits of the system need to be learned about and for which improvement could be focused. Cooperation is a consequence of the design of the work system – the system governs people’s behaviours, not the other way around. This is important in working with teams, communities, businesses. Note that the only standardisation that occurs in this approach is to develop measures of purpose. All else needs to developed in the context of the species and ecosystems of concern. With the measures in place, all work will follow the measures to drive improvement.